The ‘heel’ of Italy is a land of memorable coastal and hilltop towns, picturesque seascapes, olive groves and limestone precipices. A CITO tour by air. We explore this fascinating area from our base in Martina Franca a small town in the very heart of Puglia, the town has a lovely historic centre, a maze of winding alleys where whitewashed simplicity sits side by side with baroque extravagance.  Scenic coach tour through the southern Italian countryside to visit Ostuni, La Citta Blanca. Rising high above the vast olive carpeted plateau of the lower Murgia, Ostuni has long been an aweinspiring sight for those travelling across Puglia.  Alberobello, famous for its collection of Trullo, traditional dry-stone conical roofed dwellings which are only found in the Itria Valley. Alberobello has the largest collection of original buildings, many of which are still occupied today.  Scenic coach tour to Matera, a town renowned for its cave-dwellings carved into the canyon. The cave-houses, or Sassi, where families once lived are now coming back to life as hotels, museums and restaurants. Please note, this excursion may not be suitable to persons with walking difficulties.  Lecce, nicknamed Florence of the south. Built in local soft creamy limestone with dazzling architectural surprises around every corner, Lecce is a minor Baroque masterpiece and its spider web of streets offers a range of vistas. 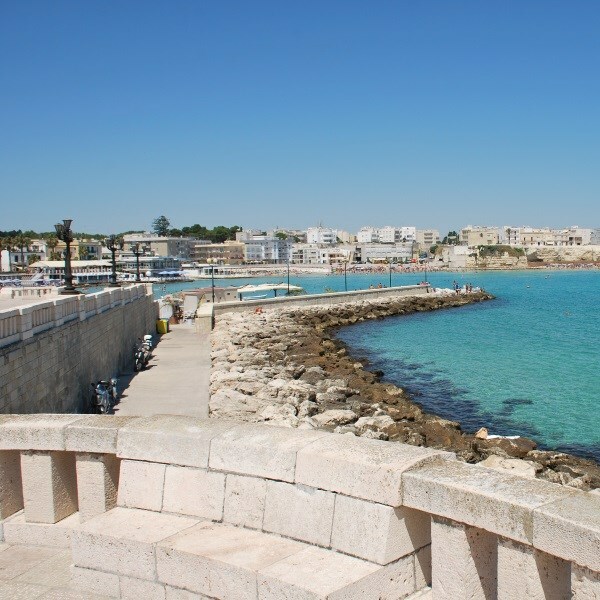  Otranto, one of Puglias most charming towns. The imposing castle, thick perimeter walls and robust towers dominate much of the town, giving way to a small port, a series of sea fronted promenades with excellent restaurants, sandy beaches and turquoise waters.  Trani, an instantly recognisable landmark for sailors navigating the Adriatic Sea over the centuries. Tranis iconic seafront cathedral is one of the finest in Italy. The old town centre is a charming medieval network of streets with plenty of fine architecture arranged around the picturesque fishing port.  2 free full days to explore further at your own pace. From a traditional farmhouse dating back to 1600 to a magnificent villa in the early 1900's, it is now a modern hotel in a superb location. Close to the centre of Martina Franca and the Old Town, the hotel also offers clients a delightful pool garden area ideal for relaxing and unwinding. All the rooms are en-suite with air-conditioning, mini-bar, free Wi-Fi, satellite TV, hairdryer and telephone.